Two other companies quickly developed PostScript RIPs, Hyphen of the UK/Italy with a software version and EFI, founded by Scitex, Israel, veteran Efi Arazi, with hardware RIP that was to become the renowned Fiery. Many others followed suit, with the focus shifting from film imagesetters to the emerging A3 colour copier market. Suddenly, a colour copier could become a PostScript printer, taking files directly from a Mac or PC computer and printing with the convenience of an Apple Laserwriter, but in full colour. Around 1990, people at the University of Utah in the USA wondered if these RIPs could drive the new breed of, mostly 36”, inkjet and electrostatic plotters from HP, Xerox, Encad and CalComp. These were replacing pen plotters in the CAD, GIS and AEC markets and so wide format printing as we know it was born. Although the early machines were slow and used fast-fading dye inks, the stage was set for a whole new graphic industry sector. Wide format inkjet evolved throughout the 1990s as RIPs benefited from increased computing power, machines grew faster, inks were more stable and, towards the end of the 90s, wider roll width printers such as the 44” (1118mm) Epson 9000 emerged. Now, wide format inkjet was gaining ground in the poster, signage and photo enlargement markets. Companies such as Vutek, Idanit and Scitex Vision pushed the width boundaries up to 3.2 and then 5 metres with solvent-ink grand format machines aimed at the billboard outdoor advertising market. Soon, the terms ’24-sheet’ and ‘48-sheet’ posters would disappear into history as digital inkjet took over from screen printing of billboards. With the coming of the new century, both technical development and market penetration progress in wide format rocketed ahead. Intense focus was placed on inks because, if wide format inkjet was to replace screen process printing, these needed to be permanent, tough and be able to adhere to any substrate. The Sericol company, renowned for its screen inks, pushed the boundaries of inkjet ink development and was acquired by Fujifilm in 2005. There are many sub-categories of inks for wide format including aqueous dye, aqueous pigmented, solvent, eco-solvent, sublimation, UV curable, hard and flexible inks. The year 2001 saw the introduction of flatbed UV printing by Inca Digital, broadening wide format’s capabilities to cover rigid, thick substrates that could be imaged directly without intermediate films or plates. Further applications exploded into digitally printed textiles, ceramics, decorative panels and even printed solar energy panels and electronic circuits. The vital print heads that eject the tiny droplets of ink also saw remarkable development. Droplet sizes are measured in picolitres (billionths of a litre or pL), and have reduced from around 80-100 pL to the 3-18pL range with variable droplets possible to deliver grayscale, fine resolution and smooth gradations, while larger droplets fill solid areas. In 2006, Fujifilm acquired one of the world’s leading industrial printhead manufacturers, Spectra-Dimatix of the USA and continues to supply these printheads to several manufacturers, including Inca Digital. Today, digital inkjet wide format printing is the fastest growing sector of the graphic arts and is pushing into packaging and industrial areas. Profit margins are still good in wide format, perhaps excepting large billboard skins that have become commoditized, with value-adding opportunities such as laminating, die-cutting, POP assembly, display systems, product decoration and exhibition booth construction all presenting extra services that deliver much higher returns on investment than offset printing. 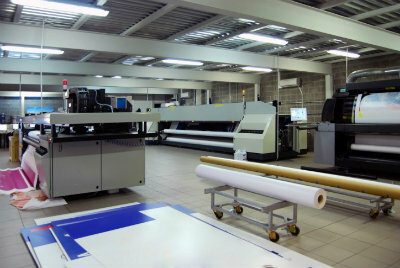 Production speeds of wide format machines have increased to a level where some are used for work that might have been performed as a short run on an offset press, folding and corrugated cartons for example. It will not stop there; Inca Digital is already pushing the 1,000 square metres per hour mark with automated load and unload of beds. Fujifilm has one of the broadest ranges of wide format technologies available and caters for almost every possible application. Roll models from 24” (610mm) aqueous models from Epson, through 64” dye sublimation models from Mimaki to grand format Uvistar printers up to 5 metres wide, are complemented by flatbed and hybrid roll/flatbed Acuity printers capable of up to 150 square metres per hour on 3.2 x 1.6 metre beds. Stepping up the productivity scale are the Inca Onset machines – the fastest in the world – at up to 725 square metres per hour. Add to this Fujifilm’s own range of inks and printheads and it is easy to see why so many printers are turning towards Fujifilm’s expertise when planning their wide format strategies.